There’s no question that 401k’s have become the norm for retirement savings. More and more companies are putting the responsibility of saving for retirement on the employee and have gotten rid of traditional pension plans. According to a 2007 Hewitt & Associates survey, 64 percent of plan sponsors said they use a 401k for their organization’s primary retirement-savings program. That’s up from about 35 percent just 10 years ago. Not only do employers like the 401k, but many employees love them as well. Most 401k plans are pretty easy to sign up for and begin saving into. A couple forms, a couple signatures and you’re on your way to putting a percentage of your income away for retirement! Unlike Traditional or Roth IRAs, which cap your contributions at $5,000 (with a $1,000 catch-up contribution if over age 50) the 401k allows up to $16,500 with a $5,500 catch-up contribution over 50! If you’re making a good income, this is a great way to get additional money saved up for retirement. Contributions are tax-deferred, which means you don’t have to pay taxes on gains each year. They are deferred until you withdraw your money in retirement. Not only can you defer your taxes, you can also take a deduction on your contributions. In other words, you get to deduct (or subtract) the amount of your contributions against your ordinary income. That’s a pretty sweet deal. Say you make $80,000 and put away $16,000 – your ordinary income is reported to be $64,000! Why you shouldn’t love your 401k! You only have 11 years to control your withdrawals (59 1/2 – 70 1/2 – there are penalties for withdrawing before that and penalties if you don’t withdraw after that). Many people don’t realize this – but at age 70 1/2 the government forces you to take money out of your 401k (unless you’re still working). How can the IRS force you to take money out? By whacking you over the head with a 50 percent penalty for not taking the withdrawal! 50 percent!! So all that money you’ve managed to save up for retirement – and perhaps you don’t need – you MUST withdraw. Why would the government do this? To get tax revenue silly! This is the biggest reason not to fall in love with your 401k. All those taxes you deferred for all those years have to be paid some time. People often assume their income will be lower in retirement and therefore their tax bracket will be lower – which means that they’ll pay less taxes. You’ll probably want to maintain your standard of living, which means you’ll need the same amount of income. Factor in inflation and depending where tax rates are – you could actually be paying more in taxes than you ever imagined! That pretty balance you had on your 401k statement isn’t really yours. You may be giving 25 percent or more back to good ol’ Uncle Sam. These things are loaded with taxes. If you pass away, your beneficiaries are forced to take money out (again think penalties here) and will have to pay ordinary income tax on every single dollar that’s pulled out at whatever tax rates apply to them! The last thing you want to do is throw the baby out with the bathwater as the ol’ saying goes. The bottom line is you need to use the 401k wisely. If your employer is matching contributions – you want to definitely take advantage of that! Take a look at your situation to determine if you’re creating a tax-infested monster. Crunch some numbers to determine if using a Roth IRA or Roth 401k is better for you. There’s some handy calculators out there that will help you figure this out. Diversify yourself from a tax perspective. In other words, make 401ks and IRAs, taxable accounts, municipal bonds and Roth 401ks and IRAs a part of your overall tax strategy. Don’t get caught up in the hype of 401ks. That doesn’t mean you don’t use them, but just don’t fall in love with them! Make informed decisions and understand what you’re saving into. What about you? 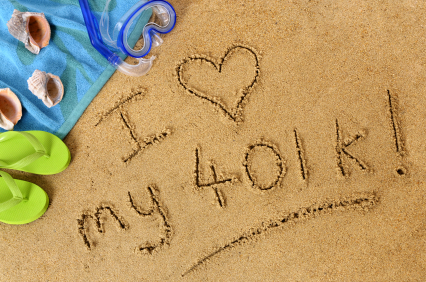 Are you in love with your 401k? What have you done to diversify yourself?